When you’re ready to start shipping product, chances are you will field many quotes from different trucking companies. Obviously, as you go through these offers, one of the most important factors will be a price point that falls within your budget and increases the potential profitability. However, it shouldn’t be the only factor you consider. You need to know exactly what the trucking company provides at its price level. More than that, you need to know that it can be a reliable part of your supply chain and support your brand. 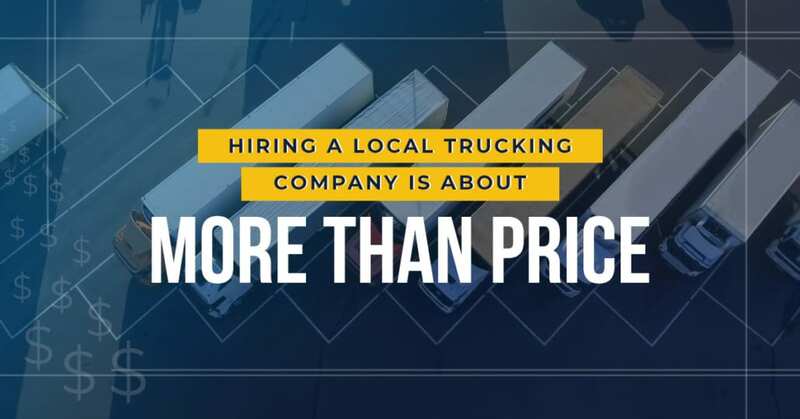 In other words, you need to look at more than the price when you hire a trucking company and consider how the following elements will improve this side of your business. A trucking company that has a long history of success has already seen and dealt with all kinds of unexpected speedbumps. This kind of experience is invaluable for the safe delivery of your products and the impact on your brand. You need drivers who have experience interacting with people on both sides of the delivery so that the loading and unloading processes go as smoothly as possible. Often owner operator truck drivers will go after business by cutting prices as much as possible, hoping that this will encourage clients to overlook their lack of experience or level of service. Do the drivers wear professional uniforms or are they allowed to show up at the final destination wearing whatever felt comfortable that day (no matter how dirty or unprofessional it may be)? Are the people at the pickup and delivery locations treated with respect and courtesy? Most owner-operators and smaller trucking companies have no supervisors or business management experience. This can lead to situations where the driver shows up wearing dirty and shabby clothes or shirts and hats that are covered with inappropriate graphics or phrases. These elements of professionalism have a direct impact on your brand, which means they can be worth a slightly higher price level. Remember, the truck driver is technically just the messenger – but you are the one that chose that messenger, and that means their performance and behavior will reflect on your brand. An experienced fleet manager is concerned about the safety of every shipment. They want to keep the vehicles running efficiently and ensuring that your products are packed and delivered correctly. This process involves a number of activities and programs, including maintenance monitoring, driver monitoring, safety training programs, anti-theft technology and more. If a trucking company is slashing prices to the “too good to be true” level, it could be because they’re minimizing their commitment to some of these programs – things that most clients won’t see on their end. You need to make sure that you’re paying for this kind of peace of mind. While many companies contract a trucking company for every individual load, others require a company with an established infrastructure that can handle more loads, regular shipments, and even provide warehousing options. When you work with a company with this level of resources – the drivers, the trucks, and the warehouses – you can keep the products moving constantly or pause your service during slow times and kick it into overdrive when things get hectic. Can your trucking company be this flexible for you? Part of this infrastructure is the support personnel – the dispatchers, managers, mechanics, and everyone else who contributes to the smooth processing and shipping of your products. These support teams continuously communicate with drivers who need specific information. Dispatchers assign drivers to the most effective routes, mechanics keep the trucks in peak condition, and dock workers load and unload the trucks effectively and safely. Truck drivers really do depend on the people helping them behind the scenes to make sure that everything gets where it’s going on time and as safe as possible. Make sure that your trucking company devotes as much to this support team as it does the drivers. In California, you can potentially be fined for hiring trucking companies or owner operators that do not fully comply with the state’s strict environmental regulations. Is your trucking company compliant? Are they doing everything they can to properly reduce transportation emissions? Any truck that was manufactured before 2010 does not meet the current regulations unless the company has invested enough money to make them compliant. Even then, all commercial trucks require ongoing maintenances to ensure they are within regulations before they hit the road. You can avoid any regulatory problems by making sure your company is doing everything possible to be compliant. Trucking is a competitive industry in California, whether you’re transporting consumables, apparel, or fragile glass products. In many cases, new and established companies will start cutting prices aggressively in an attempt to generate new business or keep their current clients. Unfortunately, slicing prices means cutting corners in other places. Whether that means you get less experienced drivers, fewer safety precautions, or less customer support, you’ll notice the difference. Sometimes, it’s the lower overhead of being an owner operator that allows them to quote some pretty low prices. However, that probably means they are also skimping on important elements like insurance, vehicle maintenance, and a professional appearance. Hiring the right trucking company in California requires finding the best balance between price and reliable service. So, when you’re ready to make your final decision, be sure you’ve accounted for all of these factors.